It’s a great night for Singpatong team to be a part of the Petch Numnoi fight at Lumpinee Stadium. After all their hard work and intense training finally went off. In the main event, Rafi Bohic successfully defended his title belt for the fourth time against Phetkanthas M-Uden. He won on points against Phetkanthas M-Uden. 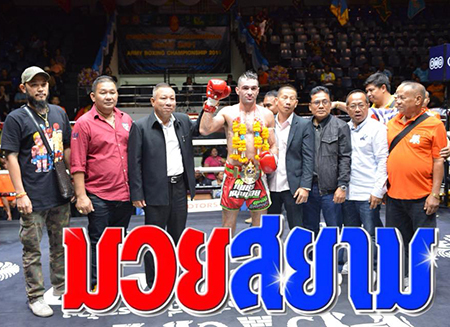 Rafi is undoubtedly one of the best fighters in his era, he’s the only French fighter who defended his title belt for four times in Lumpinee Stadium on one of the prestige stadium in Bangkok. You can watch his replay fight at Lumpinee stadium, click the photo below. Headlining the undercard, Sameuantep Por.Phetsiri faced a Thai fighter Malaitong Chor.Ruangrum in 107 weight-class division. He won on points against Malaitong Chor.Ruangrum. He’s one of the rising star of Singpatong team, He started training muay thai at the age of nine and dreaming to be one of the top fighters in huge stadiums in Bangkok like Lumpinee and to be part of the fight card is one of his dream as a muay thai fighter. An underdog once more, Phetphailin Sitnumnoi fought Priewpak Sor.Jor.Vichitpadriew in 113 weight division class and won on points against Priewpak. Pomphet Sitnumnoi showed the crowd how to be trained at Singpatong and fight like a lion roaring in the ring of Lumpinee. Pomphet struck his left knee with the combination of right elbow strike to Phetmuangprae Phumphanmuang and made him knocked out on the last round. He obviously won by knocked but he was declared the winner on points. You can watch his replay fight below.